We apologize for the access issues on http://Marketo.com . It has been fixed and we expect access to be restored no later than noon PDT. Oh my. Hate to be in customer service at Marketo today. Today, for a number of hours, our main web site, Marketo.com along with a small number of other Marketo domain properties were rendered inaccessible, preventing log in to our application. 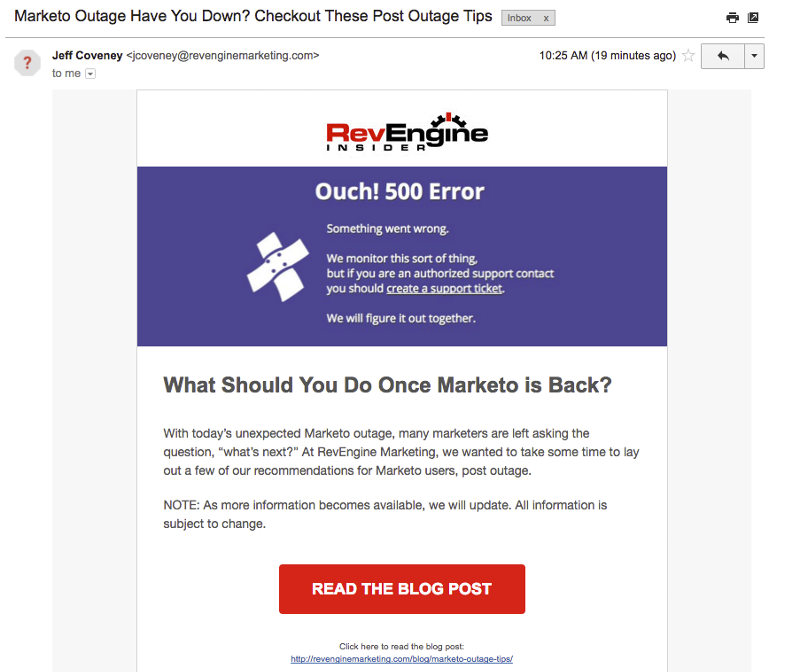 While the issue is now largely resolved, and I can assure you that the core Marketo application continued to operate in the background and your data was never at risk. I want to sincerely apologize to you and on behalf of the entire Marketo team as we take any disruption to your service very seriously. I also want to be completely transparent with you on what happened and assure you that it won't happen again. We renew thousands of domain name properties we own every year with precision, yet the auto renew process for registering our main domain, Marketo.com, failed. This catalyzed a cascading series of issues, but ultimately human and process error are to blame and again, we take full responsibility. While our global support team in Ireland was working with our DNS registrar in the very early morning hours, members of our customer and partner community helped pinpoint specific issues that aided us significantly. While this does not absolve Marketo of responsibility for this serious situation, I would like to thank the individuals who assisted us. We greatly appreciate your support during a trying time. For our global customers, please note that domain name resolution issues can take up to 24 hours in some cases to fully resolve - i.e. propagate across the internet. I personally have commissioned a detailed review of our internal operating procedures on a number of fronts to ensure we have fail-safe protocols in every area of the business. Additionally, I've addressed the company internally and while the issue with the registration is largely resolved, I have nonetheless emphasized the gravity of what occurred and extended a call to action for more precision in our operation. My deepest thanks to you, our customers and partners, for your support and understanding as we reaffirm our commitment to always deliver world class service to you. Needed to be said. I bet their customer services was lit up yesterday and probably still today heh.